We’d love your help. Let us know what’s wrong with this preview of Something Missing by Hazel Robinson. Now a grown woman, Susan returns to her childhood home of Winchelsea, where she hopes she When Susan is left orphaned, she begins a harrowing journey through the care system. Left with both mental and physical scars, Susan approaches adulthood with a self-destructive impulse. However, there is hope in the figure of her childhood friend, Max; the first boy she ever kissed. To ask other readers questions about Something Missing, please sign up. I truly can't wait for you all to get your hands on Max and Susan!!!! Susan was torn away from her hometown and left orphaned at the age of 10. Her best friend Max is the only person she truly knows. Sadly, being orphaned isn’t the worst of her childhood memories; she has had a harrowing journey through the care system leaving her with both mental and physical scars. Susan’s approach towards her adult life is self-destructive and when she returns to her childhood home in Winchelsea she is faced w 5 Stars! Susan was torn away from her hometown and left orphaned at the age of 10. Her best friend Max is the only person she truly knows. Sadly, being orphaned isn’t the worst of her childhood memories; she has had a harrowing journey through the care system leaving her with both mental and physical scars. Susan’s approach towards her adult life is self-destructive and when she returns to her childhood home in Winchelsea she is faced with the challenge of having to build a new life and deal with the emptiness she feels inside. Max is the first person Susan feels she can fully open up to and let into her broken heart, but not without feeling she will lose him at the same time. Susan feels she can’t give Max everything he needs, everything a Great Man like Max deserves. When Max and Susan meet years later, all the feelings he had for her in his youth comes rushing to the surface. Max wants to help heal her. However, something from Max’s past surfaces and threatens their happily ever after (HEA). With the odds stacked against them, will these two be able for forgive each other for the past that taunts them? Hazel F. Robinson does not disappoint at pulling at the heartstrings. With this love story you feel yourself living each and every emotion along with Susan and Max. Hazel keeps you on your toes with a few twists and turns too. It’s a must read and you will not be disappointed I can promise you that. The author did a great job with the emotions in this story. You understood the characters so it seemed like you were right there with them. This book had m Tear Jerker! This is a really brilliant emotional story. Susan is broken. After the death of her parents & then her grandmother she is put into foster care. Things haven't been good to her. She then decided to move back to her grandmothers house. Here she meets Max. Can Max break them walls around Susan's heart? Will they have a happy ever after?? Grab some tissues and jump into this book for a really good emotional read. Highly recommend this book. Looking forward to reading more from this author. This story is about Susan and her best friend and now lover Max, they both have troubled pasts but when susan returns after being put into foster care they find there way back to each other but become lovers, there are troubles along the way and a ex girlfriend who wants to split them up. I liked the range of emotions that you go through with story line some of it is deep but draws the story line in further. A wonderful job from new author Hazel Robinson on her debut novel! The story of Max and Susan was a very turbulent one. These two had many ups and downs since they reunited all these years later, and had to overcome such a large amount of obstacles which stood in the way of their happiness. Their relationship progressed very quickly which almost made it seem as if they had never been apart in the first place. At times it did feel like it was all happening too fast, but in the end you r 4.5 Stars! A wonderful job from new author Hazel Robinson on her debut novel! The story of Max and Susan was a very turbulent one. These two had many ups and downs since they reunited all these years later, and had to overcome such a large amount of obstacles which stood in the way of their happiness. Their relationship progressed very quickly which almost made it seem as if they had never been apart in the first place. At times it did feel like it was all happening too fast, but in the end you realize they were destined to be together no matter what. Poor Max and Susan went through so much individually as well as while a couple, and it tugged at my dang heartstrings the entire time. Susan had not seen Max since she was 10 years old when she was taken from her life and put into foster care. The remaining years of her youth were difficult and disturbing, and she went through some things no adult, let alone a child, should go through. These events left her scarred and extremely insecure, and I LOVED how you got to see her transform into this amazing, strong, and confident woman. The way the author incorporated scenes from the past was amazing and one of my favorite things about the story. It really gave you more of a chance to get to know the characters on a more personal level. All of the characters were each easy to relate to on some level or another, and it just felt like they were real people instead of made up characters. And my sweet sweet Max. I loved Max, and often my heart broke for him time and time again. He fell fast and hard, and he continuously had his heart broken. So many times I wished I could jump into the book and help put the pieces back together for him! I swear every time it seemed like they were about to get their HEA, another curveball was thrown their way and threw them off track! Before reading Something Missingby Hazel F. Robinson make sure you have the tissues handy because it is a real tear jerker! The story begins with a young 10 year old Susan and a Young Max attending the funeral of Susan's Grandmother and only living relative. When the Child Services come to take her away in order to put her in care Max and Susan run to the beach where he swears to take care of her and asks her to run away with him. Both of them swear they never want to be apart but they are practi Before reading Something Missingby Hazel F. Robinson make sure you have the tissues handy because it is a real tear jerker! The story begins with a young 10 year old Susan and a Young Max attending the funeral of Susan's Grandmother and only living relative. When the Child Services come to take her away in order to put her in care Max and Susan run to the beach where he swears to take care of her and asks her to run away with him. Both of them swear they never want to be apart but they are practically ripped from each other's arms after sharing their first kiss. We have barely finished chapter one and I am in buckets of tears, the way the writer is able to pull you into the story immediately bodes well for the rest of the book. Skipping ahead to adulthood we find that Susan is a character that has grown up in a rough foster home leaving her with emotional scars, nightmares and a wall around her heart. Max on the other hand has grown up in the same home with his mother, always remembering the young love of his life. She reaches her inheritance age and moves back to the town where it all started, her parents, her home, her Grandmother...... and of course her sweet, loveable Max. This story is exceptionally emotional and Hazel Robinson has really delved into them with a full access pass, tapping deeply into all of the base emotions, the primeval difference between Love and Hate, Jealousy and acceptance, and of course Revenge and Forgiveness. A true master with words, this novel will move you in ways that will surprise and astonish you. I was provided with an ARC by the author in return for an honest review. I loved this story. It is a beautiful, heart wrenching story of love and survival. Susan is 10 years old and is all alone, she has no family. The one friend she had, Max, tries to save her, but he can't. After Susan is taken into custody by the state and sent to foster homes, her childhood is hell. But, she has the will to survive. As an adult she goes back to her hometown, her happy place, which was her grandmother's home w I was provided with an ARC by the author in return for an honest review. Susan has endured a life that no one should have to go through. Orphaned from the age of ten, she is placed into foster homes that are far from loving, nurturing, and ideal. Susan leaves behind her friend Max, who is completely devastated that she is taken away from him. When she reaches adulthood, she returns to her home town to begin a new life. She once again meets up with Max. He knows she is damaged and has a true desire to fix her. As they begin a new found relationship, his damaged past re Susan has endured a life that no one should have to go through. Orphaned from the age of ten, she is placed into foster homes that are far from loving, nurturing, and ideal. Susan leaves behind her friend Max, who is completely devastated that she is taken away from him. When she reaches adulthood, she returns to her home town to begin a new life. She once again meets up with Max. He knows she is damaged and has a true desire to fix her. As they begin a new found relationship, his damaged past rears its ugly head. As I read this book, I found myself cheering for Susan and Max at times and then wanting to strangle them at other times. It is a fast-paced novella; therefore, I longed for explanation at points where I felt needed further clarification and sometimes I was just selfish and wanted more details. However, I was never bored. I just craved more. Since the ending is a little bit of a cliffhanger, I am looking forward to the next instalment. I received this book in exchange for an honest review. I was intrigued by just the title of the story and was excited to read it. The story is about the problems people face in their past and what it takes to overcome them. Susan has had many things in her life happen to her, that she did not have control over. She had some fond memories, but they were buried deep, due to such a horrific past. She moves back home and runs into her friend that has had a positive impact in her life. Max gives her a new reason for wanting love and a good life, and overcoming her past. The story becomes more interesting as they uncover more information, not just about her, but him as well. The story is a good read that shows how true love and compassion can change our outlooks with life. Hazel Robinson is a very talented writer. I just finished Something Missing and fell in love with her style and plot twists. That being said, in my opinion, she could slow down and allow the story to develop before moving on. I enjoyed getting to know Susan and Max and would love the opportunity to get better acquainted with Polly. I have a feeling I will be seeing them all again based on the delicious cliffhanger this book ended on. Had this book been split into two and some of the events more d Hazel Robinson is a very talented writer. I just finished Something Missing and fell in love with her style and plot twists. That being said, in my opinion, she could slow down and allow the story to develop before moving on. I enjoyed getting to know Susan and Max and would love the opportunity to get better acquainted with Polly. I have a feeling I will be seeing them all again based on the delicious cliffhanger this book ended on. Had this book been split into two and some of the events more deeply examined, I would have enjoyed it even more. I would give Something Missing 3 stars. Hazel Robinson's debut novel is well written, has likeable characters you can identify with and struggles that will break your heart. Susan and Max were separated when she was ten years old, tossed into foster care after the death of her parents. Grown and back in her grandmothers house she and Max are reintroduced to each other as adults where they try to pick up where they left off years ago. Their relationship does seem to pick up a little quickly but once you finish the story you understand how it could move so fast. Max struggles so much with Susan, I feel sorry for him at points in the book but in the end they both find what they need. I loved this book because in a way I can relate to this story. I could feel the emotions in Susan but not so much of Max. Max seemed a mystery. Sometimes I felt sorry for him. I can understand his back and forth feelings for Susan. Thank you for this awesome story of finding just the right love. I would recommend this book to anyone wanting a good love story. It was pretty good...for a romance. I really shouldn't say anything about this book because it's definitely not my genre. I will say that I really liked the characters. Sometimes the plot seemed a LITTLE predictable, but it also had some good twists that I did NOT expect. So even though it didn't convert me into a romance fan, I think it was a pretty good sample of the genre for a non-romance reader. I'd recommend it to fans of the genre ( If I may? ), it is really sweet. I recently won a ticket to a signing from Hazrl Robinson that she will be attending. Because I'm a decent person, i decided to download one of her books and have a read. I went for Something Missing because it's her debut...and boy can you tell. Very first page and there are editing mistakes galore. Grammar and spelling alike need a thorough rehash. It gets no better the further in you go either. Not only that but the flow of the story doesn't work and the sudden changes in P.O.V is very offputting. It just makes for a very clunky rhythm that really put me off. There's no characterisation, no emotion, no sense of realism, every new plot twist comes hot on the heels of the previous one. It's just an amalgamation of words put in to a specific order. I got about 30% in and just couldnt stomach the poor writing and all too convient conclusions to every situation that arose. As kids, Susan and Max were two peas in a pod. When Susan is pulled from the life she knows and loses the people who are everything to her, she struggles to deal with her past. When Susan goes back to her home town and reunites with her first love Max, it seems that they easily transitioning back into their old ways. Though Susan and Max both have very sorrowful pasts, they try to work things out within their own selves, but their scars of the past threaten to pull them apart. They need to lean on each other to overcome the things that were done to them. This is a very easy going romance story, but I felt it was very rushed. I would have preferred that many aspects of the story to be slowed down a little. It could have easily been another 100 pages long to fill in some of the gaps in the story, and to give us a little more of how things were playing out. It just all seemed to progress too fast. I like stories with more angst and full lead in, so I may just be partial to more of a full detail story. The storyline itself was very refreshing, this is not your typical run of the mill romance where you know what it going to happen right off the bat. There are some twists and turns and it was easy to relate to the pain that both Susan and Max endured in their lives. It was super easy to fall in love with Susan and Max and want things for both of them to work out. The heart aches of each of their pasts touched me and I could not help but to cheer for each of them to find some healing. Overall, I really enjoyed this story, it was an easy read that I devoured in just two sittings once I got into the swing of 3rd person. The twists and turns kept me from putting it down. The way things turned out was perfect for both characters. I’m a sucker for a sweet and simple romance story and Something Missing felt like that kind of book. Susan was reconnecting with Max, the first boy she’d ever kissed but of course, things weren’t going to be that straightforward. Susan was still damaged from the abuse she suffered growing up and Max was being secretive too. It all sounded like the makings of a nice romance film to me. The issue I always have with watching romance films is that they move too quickly whereas books tend to give you more time for things to unfold at a better pace. Sadly for me, whilst Something Missing had a lot of promise, character and story development was lacking and everything progressed like I’d accidentally knocked the forward button during said romance film. The thing is, I actually enjoyed parts of this book. I thought the things which happened in the plot were interesting enough and the characters started off intriguing although I thought Susan became a little irritating as the book went on. I probably preferred the side characters of Polly and Beth more. Had the author extended events in the plot so major plot turns weren’t over and done with in the space of a couple of sentences, I would have enjoyed the story a lot more. So as for writing a good plot, I think the author succeeded but the pacing just wasn’t for me. Something Missing was emotional and I liked that but after a decent start, I was a bit disappointed with most of the book. It was too rushed and predictable. The ending did pick up a bit though and I was more interested then than I had been for the rest of the book. I’m not sure that this will be the only book I read from this author but I’m just hoping for better pacing and stronger development in any books she writes in the future. I actually had the opportunity to read this book in beta and i totally meant to. Unfortunately it got lost in the shuffle. If your a regular on my blog you know im always reading up a storm. My tbr is overwhelming, i work a full time job and theres the family, Oh and sleep. So sometimes despite my best efforts things fall between the cracks. Im so disappointed in myself because i really feel i couldve helped with the book. There were a few things i wouldve suggested and maybe Hazel wouldve taken I actually had the opportunity to read this book in beta and i totally meant to. Unfortunately it got lost in the shuffle. If your a regular on my blog you know im always reading up a storm. My tbr is overwhelming, i work a full time job and theres the family, Oh and sleep. So sometimes despite my best efforts things fall between the cracks. Im so disappointed in myself because i really feel i couldve helped with the book. There were a few things i wouldve suggested and maybe Hazel wouldve taken my advice and then again maybe not. Susan survived things no person should have to endure let alone a child. As a child she lost everyone she loved to death or circumstances. Now as an adult she comes back and meets with her old friend Max. He did his best to stop her from leaving but he was just a boy. Now hes a man, girls are falling over themselves to get to him. All of that doesnt matter now that Susan is back hes only got eyes for her. He knows she damaged just not how damaged. Thankfully she will let him know when shes ready. Max himself isnt a saint things from his past actually greatly effect his relationship with Susan. Their love was a bit of a fairy tale at times and like watching an episode of Jerry other times. Susan returns "home" after being placed in the foster care system. She was taken away from her childhood best friend Max, the only boy that she ever kissed. She is so broken both physically and mentally and keeps herself from getting attached to anyone. But will she allow herself to open up to Max and attempt to heal the brokenness inside and replace what's missing? Are the physical scars hiding her truth? Will she find the something missing to fill the hole that she thought would never be fulfi Susan returns "home" after being placed in the foster care system. She was taken away from her childhood best friend Max, the only boy that she ever kissed. She is so broken both physically and mentally and keeps herself from getting attached to anyone. But will she allow herself to open up to Max and attempt to heal the brokenness inside and replace what's missing? Are the physical scars hiding her truth? 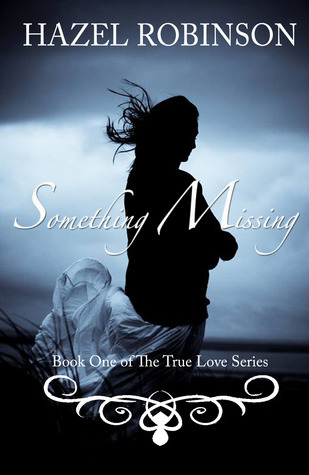 Will she find the something missing to fill the hole that she thought would never be fulfilled? Will Max's skeletons from the closet push Susan away or help make their relationship stronger? He has dark secrets in his past you would never expect from sweet and perfect Max. It's so hard to think about the awful things that are done to children while in the system. This is the first book that I have had the opportunity to read by Ms. Robinson. First, I know she is from the UK, so some of the wording will be different than what I am used to here in the US, but there was a LOT of grammatical errors and an unclear delineation of breaks in time. All of these added up to a hard read, but I really did love the characters of Susan, Max and Polly. Also, from the prologue in the book, I was kinda expecting a different story from the one that was told. I would say those in the UK would probably get the wording and have no problems with it. Ms. Robinson definitely left you with a couple of twists and turns, and a subject that really needs to be more open to the public. There are so many good people out there that would make great foster families, but for whatever reason (scared, financial, etc.) they pull away from it and the kids are always the ones to pay. Something Missing is about finding love again after surviving a lot of hurt and heartbreak. This is an emotional read that is filled with angst, sorrow, romance, and healing. I really liked the history between Max and Susan. I am a sucker for stories where the hero and heroine find each other again after many years apart and this story definitely fits that description. There are many parts in this book, that will tug at your emotio I received this book as a gift in exchange for an honest review. Something Missing was a good read. It was not what I excepted. For some reason I was expecting a quick fluffy read, Something Missing is not a fluffy read, It's full of emotion. It takes you on a roller coaster ride of emotions. I was drawn right from the beginning. It starts with Susan having become and orphan and is being taken away form her best friend Max. Years later and after a tough childhood, Susan ends up going back to the house she grew up in. She runs into Max. The connection between t Something Missing was a good read. It was not what I excepted. For some reason I was expecting a quick fluffy read, Something Missing is not a fluffy read, It's full of emotion. It takes you on a roller coaster ride of emotions. I was drawn right from the beginning. It starts with Susan having become and orphan and is being taken away form her best friend Max. Years later and after a tough childhood, Susan ends up going back to the house she grew up in. She runs into Max. The connection between them is still there. This was the first book that i have read by this author and I enjoyed it. Only one criticism I have is that I wanted more of the story. It kind of jumped from bits of the story too quickly and I wanted to get a deeper picture. The end of the book was filled with emotion and the character appeal was stronger, but all in all I enjoyed the story. Susan and Max were childhood friends until Susan's gran died and she got taken into care. This is when Susan's nightmare started. Physical and mental abus This was the first book that i have read by this author and I enjoyed it. Only one criticism I have is that I wanted more of the story. It kind of jumped from bits of the story too quickly and I wanted to get a deeper picture. The end of the book was filled with emotion and the character appeal was stronger, but all in all I enjoyed the story. Susan and Max were childhood friends until Susan's gran died and she got taken into care. This is when Susan's nightmare started. Physical and mental abuse left her broken. Returning to her home village to her grandmas house seems like the best idea for her. Ben and Susan reconnect quickly and they go through a lot of ups and downs as they get to know each others past. Wedding bells, babies, happy ever after is all they both want. when she isn't writing she is watching her favourite TV show 'Supernatural@ or spending time with her three children and husband.